All in all, the Lowrance 000-11657-001 Elite-5X CHIRP with 83/200+455/800 Transducer is fitted with advanced technology to ensure that the users will always find their prey effortlessly. Are you going through a tough time while searching for a good fishing spot? Do you wish for a miracle that can take you right to your prey? Well, guess what? You can make this dream come true, thanks to the Lowrance 000-11657-001 Elite-5X CHIRP with 83/200+455/800 Transducer. This remarkable fish finder is not just portable and travel-friendly, but it is also incorporated with a bunch of phenomenal features. It is designed to ease up your life by minimizing your effort and saving your time. 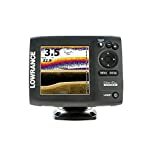 The Lowrance Elite-5X CHIRP Fish Finder functions by combining CHIRP sonar technology and Down Scan Imaging that work on a frequency of 83/200 kHz and 455/800 kHz respectively. The CHIRP sonar makes it easy for the user to identify targets below the boat at greater depths, whereas the Down Scan imaging provides clear images of the underwater objects. The unit consists of a selector menu with quick access to all the features through a one-thumb operation. Plus, it has a multiple window display which enables users to easily select from the pre-set page layouts that include a three-panel view with chart, Down Scan imaging as well as CHIRP sonar ranges. In addition to this, the Advanced Signal Processing (ASP) lowers the need to manually adjust settings for viewing fish and other bottom structures more clearly. The Lowrance Elite-5X CHIRP comes integrated with a top quality GPS system that has the ability to identify your location and overlay it on one of the saved maps of various waterways in order to identify the best fishing spot for you. Also, you can save the route that takes you to the location so that you can come back to it again for hunting, using the Trackback function. In short, you are never going to be at a loss over where to go fishing again. Moreover, it is reasonably priced so that most people benefit from it. It even enables you to revisit hotspots again in future by having a look at the sonar history. Furthermore, this fish finder is compact and highly portable, therefore; you can easily take it on any boat. The screen size of this model is 5-inch so you may find it a little small to view the multiple data, however; images displayed are bright and clearly understandable. Overall, this device is worth your investment.